The new Virus TI promises to bridge the divide between hardware and software instruments, and create a world of Total Integration, while still offering the classic Virus sound. Is it a hard reality, or have Access gone totally soft? 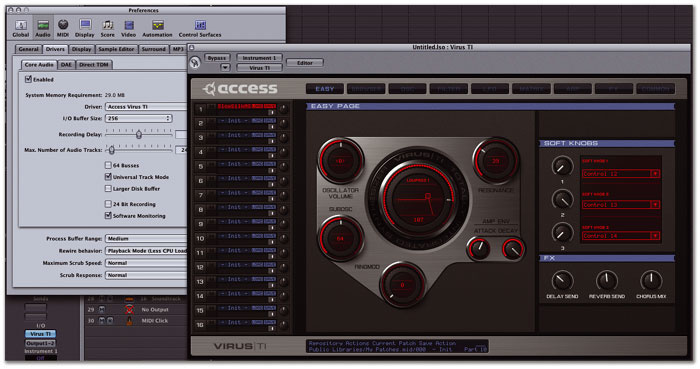 It's fair to say that there are very few electronic musicians who haven't heard of Access Music's Virus synth, and still fewer who wouldn't like to own one. When you think about it, that's a pretty amazing achievement for a hardware synth that grew up during the software revolution. The Virus reminds me of The Doctor from Doctor Who; firstly, it seems to be regenerated every couple of years, and secondly, if you got into synths at any point over the last eight years, you might fondly remember 'your Virus', which would be whichever one was available at the time of your interest. The latest incarnation was announced last year, previewed in SOS December 2004, and first shown at Winter NAMM at the beginning of this year. Its release was promised less than 50 days later, but it finally showed up on October 3rd. The phrase 'hotly anticipated' is over-used by almost everybody, but in the case of the Virus TI, as the new model is called, it's appropriate. The reason can be summed up by two words: Total Integration (hence Virus TI). 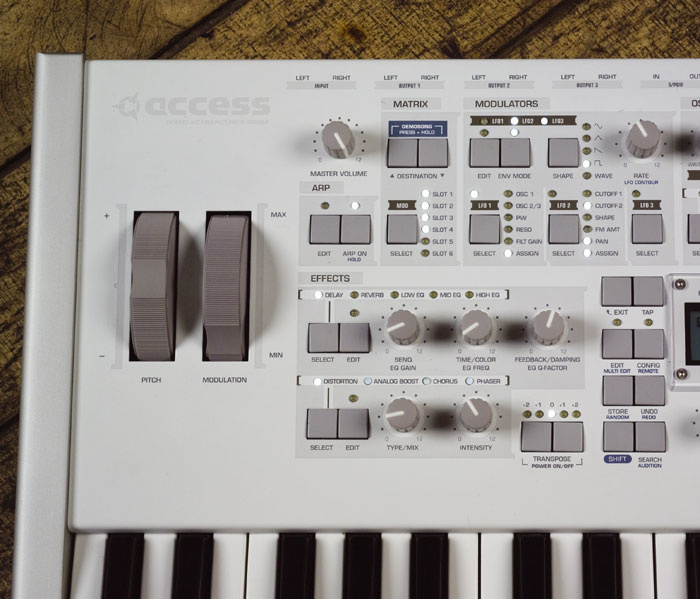 The TI brings together Access' experience with both hardware and software versions of their synth for the first time in one package. The concept is brilliant; the Virus TI combines the best of both worlds from previous Virus products and is able to run as both a stand-alone synth, and as a sample-accurate instrument plug-in within your computer-based sequencer. If Access had stopped there, I'm sure we we would have been happy, but when they say total integration, they really mean it. The Virus TI can also act as an audio recording device for your computer (making use of the onboard audio input and output), or as a MIDI interface (using the built-in MIDI ports and the keyboard, if your TI model has one). And lastly, the Virus's hardware control surface can control the Virus software running in plug-in mode (and the plan is to make it usable as a generic control surface for other plug-ins and applications). Best of all, though, the Virus TI can do almost all of these operations at the same time. Access have always offered Viruses in multiple versions, and the TI is no different. Three TI models are available: Desktop, Keyboard, and Polar. 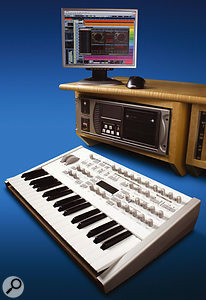 Desktop is the Virus's original tabletop-style design, but the TI incarnation has a slightly darker, sleeker appearance than that of the previous Virus C. The dark, wooden panels on either side can be replaced with the supplied kit, so you can install the synth in a standard 19-inch rack. One annoying thing about racking previous Virus models is that once in the rack, the ports that are normally on the back of the unit are now on top, making them hard to access and meaning that you have to leave two or three units of space above the Virus. To solve this problem on the TI, Access have made it possible for you to rotate the physical position of the ports so that they will be on the back when rackmounted. Very neat! The Virus TI Keyboard, which is the only model of the Virus TI I've yet to see in person, has a 61-note keyboard with mod and pitch wheels, and replaces the previous Virus kc model. However, arguably the most desirable member of the family is the mostly white Polar, which replaces the previous 'lust-have' Virus Indigo and Indigo 2 models, and was used for most of the photos in this review. As you can see, the Polar looks totally, well, cool! Like the Indigo, the Polar's compact design offers a three-octave, 37-note keyboard (which felt of better quality to me than that of the Indigo, with a lighter action), and there's now a elegant wooden edge to the casing underneath the keyboard that adds a touch of class to the instrument. This is basically the Virus you'll want to sell your granny for. 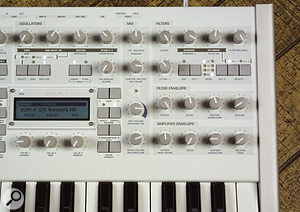 All Virus TI models feature identical controls and features, and the actual control surface has been redesigned slightly (see close-ups photos); eight buttons have been added, including a Shift key. The most obvious change is the new 128x32-pixel LCD display, which is a huge improvement over previous Virus screens: it's easier to read, and offers more information. On the other hand, when you switch on the Polar, it's apparent that its white LEDs are rather bright. While this would be great on a darkened stage, it can be a little distracting in the studio. Fortunately, you can adjust the LED brightness in one of the menus! The relative brightness of the BPM LED can be adjusted separately. Underneath the new display are three soft knobs (up from two on the Virus C), which are now much more useful, as they have become an integral part of configuring parameters in the new operating system. 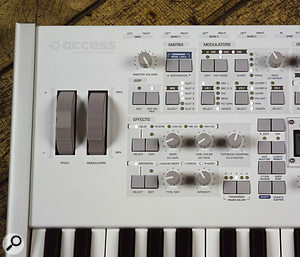 On the main page, the sound-altering function of each soft knob is labelled above on the lower part of the screen, and by pressing Shift the three soft knobs enable you to quickly dial up different patches, adjusting Category, Bank and Program settings respectively. This speeds up patch navigation and is better than the Value knob on previous Virus models. Each editing and configuration page now has up to three parameters that can be adjusted by each of the soft knobs, which makes them much easier (and quicker) to work with. If you have a synth with many rotary controls and memories, there's always the issue of how to reconcile the physical positions of the knobs with the stored parameters. 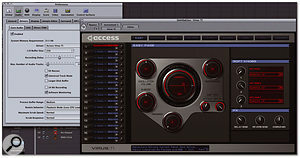 Access's solutions have always been pretty good, and the three knob responses implemented in the very first Virus are still present in the TI: Jump, Snap and Relative. Jump means that the value is set to the exact position of the knob when you make an alteration, Snap means that the value won't change until the knob passes the point of the original value, and Relative means that the knob adjusts a value relative to the original value. On the TI, this is displayed more clearly than before, thanks to the new screen; when you adjust a knob, a window pops up to tell you what the current value is, what the former value was, and, if you're in Snap mode, which way to turn the knob to set it to the original value. The window disappears if there's no further adjustment after a few seconds. Under the bonnet, Virus synths are powered by Motorola's 56k family of DSP chips, which is commonly used in pro audio products, including, for example, Digidesign's Pro Tools TDM. This architectural similarity is what allowed Access and Digidesign to announce a software Virus plug-in for Pro Tools 24 Mix systems as long ago as 2000. 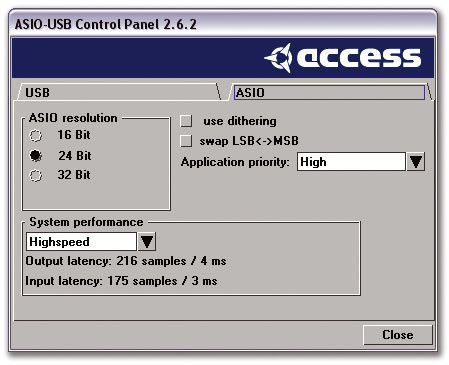 After this, Access released a version of the Virus for TC's Powercore DSP engine platform in 2002. This made sense, because Powercore is also based around Motorola 56k DSP chips. Unlike the Pro Tools version, Virus Powercore was (and still is) sold in two versions: a 'base' licence, allowing you to run just one instance of the Virus plug-in on one DSP chip, offering 16 voices, and an 'unlimited' licence that allows you to run multiple instances of the plug-in on as many chips as you have available in your Powercore system. The architecture of the Virus TI has been completely overhauled from previous Virus engines, and now features a dual-DSP configuration of faster processors to offer more power than ever before. At its most basic level, this means more voices, and Access quote a polyphony of 80 voices 'under average conditions', which you may remember was the number of voices quoted for running the original Virus plug-in on Pro Tools Mix systems five years ago. I didn't get near this number of voices when using Multi mode (up to 16 parts simultaneously), and despite the increased DSP power, the polyphony is dependant on how many oscillators you set and what effects you're using. It's therefore hard to be precise about the polyphony you can expect from the TI. If you use seriously DSP-intensive patches, you might run out after three or four parts with only slightly more polyphony than the Virus C (maybe about 40 voices). Leaner patches (fewer Unison voices, for example, and fewer effects) will give you greater polyphony. But in the studio context, it was enough that I didn't run into problems. The Virus C's physical power button has been replaced with a soft power button on the TI, so the synth is in Standby mode when you plug it in, and one of the Transpose LED blinks to indicate this. To power it up, you press the two Transpose buttons together, and you do almost the same to put the synth back into Standby mode, except you have to hold the buttons down for two seconds while a countdown appears on the Virus' display. 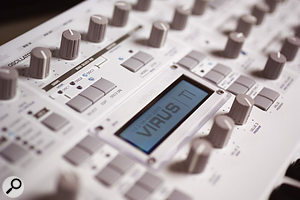 Once the Virus is powered up, it behaves just like a stand-alone synth, and if you don't want to use your Virus TI as a plug-in, you don't have to. The new TI sound engine is worth the price of admission, even if you forget the computer integration aspect. Comparing the TI to several previous Viruses, I felt the TI sounded better, partly due to improvements in its effects algorithms and also to having access to greater polyphony for more Unison voices. This impression may also be due to the TI's new 192kHz D-A converters (with optional soft limiting), and also to the improvements in the DSP engine. Although the Virus' D-A converters are now specified as being 192kHz, the Virus' internal clock offers either a 44.1 or 48kHz sampling rate. So my assumption is that the engine itself still functions at either of these sampling rates, rather than at 192kHz, and that this high value is more indicative of the quality of the converters used (it's not clearly stated anywhere, but my guess is that incoming 88.2 or 96kHz audio is currently sample-rate converted at the input, so that the voice count isn't halved). The A-D converters have also been improved, and now operate at 24-bit resolution, as opposed to 18-bit. One really nice improvement on the TI is that you now have independent delay and reverb effects for each of the 16 parts, and this is great when working in Multi mode, which embeds all the data for every part in one patch, rather than simply referencing Single mode patches as in previous Viruses. But perhaps the highlight of the new Virus TI engine is the addition of two new oscillators: Hypersaw and a true Wavetable oscillator. There are 72 Wavetables to choose from, plus a sine wave, and these cover the foundations for creating interesting pad sounds, gritty, noisy stabs, or those FM/bell-like cascading sounds that you remember from Waldorf synths. One nice touch is the ability to adjust which wave in the table you're using via the Wavetable Index parameter, and the waves are crossfaded to allow for smooth transitions, which works really well. If you assign Osc 2 as a Wavetable oscillator, you can also use the FM features of the second oscillator to sonically destroy anything! Hypersaw is basically a sawtooth oscillator, except that it's able to generate up to nine sawtooth waves in parallel, and you can add more and take away these additional oscillators in real time with no glitching, which is really neat. Needless to say, this is great for huge-sounding patches, and there's a detune option on the Hypersaw oscillator to really thicken the sound, along with a sync toggle. However, because Hypersaw is effectively 'nine oscillators in one', you can also use the Virus' Unison mode to have up to eight Hypersaw oscillators per note, which means you could have 72 oscillators per note! Or, do the same with the second oscillator and get 144 oscillators per note, and add a bit of the sub-oscillator for bass! This is just plain wrong, but so addictive! Other features of the new TI engine include six modulation matrix slots with one source and three destinations, giving six sources and 18 destinations in total. There are, however, a few problems that were present in the engine that Access are gradually fixing through updates. There are some issues with the arpeggiator when trying to slave the Virus to an incoming MIDI Clock signal (which older Virus users may remember from previous 'first' versions), although I didn't find this a problem when using the Virus in TI mode as a plug-in, presumably since the sequencer coordinates the sample-accurate sync. And there seems to be a problem with the tuning in the arpeggiator occasionally, which completely foxed me for a while, but I later found other users having the same problem, which has been described on forums as the 'drunken' arpeggiator. In short, aside from a few teething troubles, the new sound engine is amazing. However, it's now time to look at the seriously impressive aspect of the new Virus — the computer integration. Installing the Virus TI for use with your computer sequencer is easy, and although a CD-ROM is supplied containing the installation software, Access recommend checking their web site to make sure you have the current version. Once you've launched the installer, the appropriate software will be installed, and during this process Windows users will be asked to connect the Virus to a USB port on their computer (Mac users can simply connect the Virus after the installation). The Windows installer advises you to 'choose the USB port wisely' since, as with all USB devices, Windows will try and install the drivers again if you plug the Virus TI into a different USB port later. The Windows installer also informs you (and this advice concerns both Mac and Windows users, as described in the manual) that you cannot connect the TI to your computer via a USB hub — see the box over the page for more info. Once the drivers are installed, the Windows installer will ask you to disconnect and reconnect your Virus TI, and after this the installation will be complete. If the installer is supplied with a firmware update for the Virus TI OS, the cross-platform Virus TI Firmware Update application will run for about 10 minutes, during which you can't do anything to the synth. Following this, the TI will reboot and you'll need to restart your PC or Mac. It's now time for the real fun to begin. I mentioned earlier in this article that the Virus TI can operate as an audio and MIDI interface, and during installation Direct X, MME and ASIO drivers will be installed for Windows users, and Core Audio and MIDI drivers for Mac users. This means that you can use the TI as a front end for your computer music system with no extra MIDI or audio hardware required, which is useful. And the stand-alone Virus synth remains operational, even when the TI is being used as an audio and MIDI interface. In your sequencer, two additional MIDI ports show up as TI MIDI and TI Synth. Sending MIDI to the first port will cause the data to be output from the Virus' MIDI Out port, while choosing TI Synth will trigger the actual Virus synth. And what's really nice is that the audio driver output will be mixed with the output of the Virus synth engine, which already gives you a much more integrated approach than ever before with a hardware synth. The only things I found annoying were the rough nature of the user interface for the ASIO Control Panel for Windows users (see right), and the lack of documentation describing how to use it. It's not obvious how the options should be configured, and the layout looks like a throwback from Windows 3.1! Performance-wise, though, I didn't have any issues with the USB audio, and using the smallest buffer size possible, Cubase SX 3.1 reported an input and output latency of 3.968 and 4.898ms respectively. On the Mac side, I set the buffer size in Logic to 256 samples (approximately 3ms at 44.1kHz) and this seemed workable. Photo: Mark EwingAll three TI models feature the Virus's standard complement of three stereo output pairs on jacks, a stereo input pair, a stereo headphone output, and MIDI In, Out, and Thru connections. All Virus models also now include RCA connections for S/PDIF input and output, which means that for the first time, you can get audio into and out of the Virus digitally. There's also the all-important USB 2.0 port for computer connectivity. In addition to these facilities, the Polar and Keyboard models also feature a built-in PSU (the Desktop has an external brick), two jack connections for Control and Hold pedals... and a blinking light in the shape of the Klingon-like Access logo. It beats in time with the current tempo of the Virus, and you can set how dramatically the blinking appears above the normal lighting of the logo by setting the Logo Groove parameter in the System 5/5 Config page, where '0' makes the Logo always on, and '127' causes the logo to blink and fade completely to darkness after each beat. It'll look good on stage! Of course, the feature we've all been waiting for is to run the actual Virus synth engine as a plug-in. And if you're wondering whether the Virus TI can still operate as an audio and MIDI interface when running the Virus engine as a plug-in, the answer is yes — which is really, really useful! The Virus TI's plug-in application is referred to as Virus Control, and when you start the plug-in on your host, the Virus TI will switch into Sequencer mode and no longer work as a stand-alone synth. The Virus control surface itself effectively becomes a control surface for the Virus Control plug-in, and this control is achieved by internal communication between the TI and Virus Control, so there's no additional work required by the user. And despite the internal nature of this communication, you can still automate Virus Control with your host's own automation system. Again, this requires no setting up: just enable automation in your host, adjust parameters on the control surface, and the host will record the movements as if you were adjusting on-screen controls directly. The beauty of this system is that you can control the plug-in at any time from the TI, regardless of which Track is selected in your host. A further mode Access have created for the Virus TI is Remote mode, and this enables the Virus' front panel to control other software instruments and effects in addition to the TI — or rather it will. Unfortunately, at the time of writing, Remote mode isn't implemented in the current version of either the TI OS or Virus Control. Virus Control (shown overleaf) appears to the user as if it were any other instrument plug-in. Behind the scenes, MIDI data from the instrument plug-in is sent to the synth engine via USB, and audio from the synth engine is sent back to Virus Control so that the plug-in outputs audio to the host application, allowing you to use other plug-in effects to further process the Virus' audio output. Like many products running over USB, the TI seems to work variably from computer to computer, depending on configuration and host. Check out the unofficial Virus user forum at www.sunesha.nu/virusforum/ and you'll read all manner of horror stories, while other users claim their TI is working OK. I fell into the latter category, aside from the non-USB related sound engine problems I've already mentioned, and a slight problem with latency. If you're using the TI as your main audio interface as well, the audio has to travel back down the USB cable again, and although the audio would be have to be sent out by the host at this point no matter what interface you were using, I noticed the latency when using the Virus as both a plug-in and an audio interface was greater than when using another main audio device. Even with an additional audio interface, though, you have to be careful to keep your buffer sizes small (no greater than 256 samples) to keep the TI plug-in playable. However, the upside to Virus Control is that latency is only an issue when performing in real time: on playback, the TI, like any other instrument plug-in, is capable of sample-accurate operation. And another bonus is that the audio doesn't have to be routed back to your host sequencer when using the TI in Sequencer mode. Like the Virus hardware, the Virus Control plug-in also has multiple outputs: there are two stereo outputs available to your host, and in Virus Control 's Common page, you can set whether the main and secondary audio outputs are routed to an output on the plug-in, or directly to an output on the Virus TI itself. This latter option has a few pros and cons; firstly, it's more useful if you're using the Virus TI as your main audio device, so you don't need an additional mixer, and also, it prevents you from further processing the audio output of the Virus in your host. On the plus side, though, you could use the direct routing for real-time performance, and then switch to the plug-in's output for playback and mixing. It's a nice touch that addresses a potential problem. The Virus Control interface is pretty well laid out, and, as the manual points out, if you're familiar with using a hardware Virus (or a plug-in version), the TI plug-in is pretty self-explanatory — which is just as well, since there is little documentation available for Virus Control at the time of writing, although more is planned. I particularly liked the Arp page, which makes programming the arpeggiator so much easier than on the Virus' control surface, and the new Easy page looks pretty cool, with the ability to adjust both the cutoff frequency and resonance of the filter with the mouse at the same time. All 16 parts of the Virus are displayed in a column to the left of Virus Control, and here you can load and save individual patches, adjust the volume and pan of a part, and select a part for editing in the main display. Sequencer mode, which is the mode the TI uses when you're working with Virus Control, is similar to Multi mode, in that you have 16 simultaneous parts, but it actually works like having 16 simultaneous Single modes rather than one Multi mode. Virus Control also allows you to access any of the ROM and RAM banks on your Virus TI. In addition to storing patches directly on the Virus, Virus Control can also save patches to your local disk if you run out of space on your Virus, and as on the Virus Powercore plug-in, these are stored as banks of patches in MIDI file format. Actually, the Browser page of Virus Control is the only aspect that slightly lets the side down. Access chose to display the patch list as if the patches were on an LCD screen (a bit like NI's FM7), and style aside, this just makes it hard to read the patch list. Some better (faster) search facilities would also have been good, although I hear this is another area Access are working on. While it's true that using audio devices with USB hubs can often be problematic, I decided to ignore this warning initially and see if the Virus TI would still be functional connected in this way. However, I wasn't being awkward: the Windows computer on which I was installing the Virus TI was in a machine room some 20-30 feet away from the main workstation where the monitors, keyboards and Virus TI were located. Since the maximum length for a USB cable (to allow for reliable transmission) is about 16.5 feet (five metres), not being able to use a hub was potentially a problem, and using a powered USB extender wouldn't help, unfortunately, as these are effectively implemented to behave as if they are USB hubs. So I ignored the initial warning during installation, and at first, all was well. The installer detected that I had connected a TI (even though it was via a hub), and the drivers were still installed correctly. At this point I was thinking 'hub, shmub!' — until I tried to use the Virus Control plug-in in Cubase SX3, that is. Virus Control opened displaying the Total Integration Status Page, and while the Audio and MIDI Communication sections contained green ticks, the USB Communication test had failed, and been awarded a large red cross, with the words 'You are using a hub...'! While this is annoying, it's understandable. Given the number of incompatibilities that users could encounter using the many possible types of USB hub, it does make a degree of sense for Access to ensure that the TI is used in a way that always gives the best possible results. On the other hand, if you're using a computer with a limited number of USB ports (such as an Apple Powerbook), it would be handy if an Expert mode could be added for those users who want to take their chances! I really love the Virus TI. It's not perfect; there are some issues to be resolved, and features to be implemented. But, for me at least, there's nothing about the TI in its current state that would prevent me from having a good time or making a purchase, despite the fact it's not uncommon to see the odd bug. For example, I noticed that when I was selecting patches from the TI in Sequencer mode, Virus Control didn't always display the correct patch name. Still, it's reassuring to see Access releasing regular updates on the Internet for users who have already bought the new Virus, continuing their good practice of offering regular updates for previous Virus models. The Virus has always been a fine-sounding synth, and it's always been fun and intuitive to program. The TI takes this to the next level; the new engine, with its additional DSP resources, is fantastic, and the improvements to both the Virus' hardware user interface and the new software interface, in the form of Virus Control, make the TI a dream to program. The 'total integration' features have been well thought out, and, for the most part, well implemented — everything you could conceivably want to do with a Virus attached to your computer seems to be possible. The only missing piece is the 'still to come' Remote mode, but I don't think this is a serious omission. I think I'm going to buy a TI Polar because, for me, it's the perfect desktop instrument. I can have it right next to my computer keyboard and mouse, it's the perfect master keyboard for generating MIDI data when an 88-note keyboard isn't required, and, of course, it has the best-sounding Virus synth engine to date. It's not particularly cheap, and the Polar costs the same as the 61-note Keyboard version, but it's such a great instrument that I can't really criticise the price, because you really do get what you pay for. Access' latest Virus incarnation was worth the wait: users for whom the TI will be 'their Virus' and seasoned Access veterans alike are in for a treat. A bit like fans of Doctor Who and the BBC's new series, really. While it might be obvious, you can't run more than one instance of the Virus plug-in simultaneously, since you only have one Virus engine attached. If you try to add another instance, you'll see the Total Integration Status Page in Virus Control informing you that Audio, MIDI and USB Communication have failed. Fortunately, this does no harm, and you can simply remove the second plug-in instance and carry on using the first. One potential way around only having one Virus TI (and let's not forget the TI is 16-part multitimbral!) would be to use the Freeze feature found in modern sequencers, where a plug-in's output is rendered as an audio file, freeing up the resources occupied by that plug-in, and allowing you to open additional instances. This usually liberates the computer's CPU, but in this case, it's the TI that would be freed up. Using Freeze in conjunction with the TI could be rather neat; imagine being able to use one instance, freeze it, move onto another instance, freeze that, move back to the first instance and make changes, and so on. So long as all TI instances were 'frozen' before opening or unfreezing another, it could all work rather well. Unfortunately, Freeze-style features aren't compatible with the Virus Control plug-in at present — not even if you're using the Polar! The release notes promise it for 'a future upgrade'. This didn't stop me trying it nonetheless, but I got very corrupted-sounding audio, almost as if the Virus was trying to play at a faster tempo. This makes sense, because most Freeze functions work by performing what is basically a faster-than-real-time bounce. Even if Freeze had worked, though, I noticed that the plug-in wasn't always released under Logic Pro; the Virus TI stayed in Sequencer mode even after the original plug-in instance was frozen. Cubase SX has an 'Unload Instrument when Frozen' option for use when freezing, and this will come in handy when TI Freeze support arrives. Even if you'll never need to use the Freeze function in your sequencer, the behaviour just described could still affect you, as it applies to all non-real-time, off-line bouncing, not just freezing. This means that if you do a bounce down or export of your finished mix inside your sequencer, you'll need to make sure that the real-time mode is selected for the time being. Just as I was about to submit this article, Access posted a version 1.0.3 update on their web site. According to the company's release notes, v1.0.3 fixes a problem where the tempo was displayed instead of Patch Panorama on the Common page, has improvements when the host sampling frequency is 96kHz, and fixes an issue where some pop-up menus displayed the wrong items. The Remote functions and Freeze support are still to be added in a future release, though. The cold realities of having to move house several times in quick succession, plus the difficulties and costs of keeping vintage synths well serviced, have conspired mercilessly to whittle down my studio. Recording and sound design is now a 99-percent computer-based experience for me. I have no regrets; I like contact with the hardware that's producing the sound I want, but I'm able to run more synths, samplers and effects in software than I've ever owned at one time. And I like a life which isn't drowning in leads and means that I have desk space to spare. But working solely in software presents its own problems. New software demands more RAM and the latest CPU speeds, while your own computer stands still. Thus, the idea behind the latest breed of hardware synth — the type that adds DSP resources to your system rather than demanding more of their host — is one I like. Access's Virus TI is a particularly attractive implementation of this idea. The Virus family has become a classic in a relatively short time, and software implementations have been quite demanding, running on higher-end DSP-based audio systems. Host-based options would suffer and, being frank, no doubt Access would suffer from piracy. The hardware-plus-software approach provides manufacturers with security, and users with power. I haven't had the TI long, but even in that short time, digging deeper has been rewarding. The only thing I didn't like on the desktop version I examined was the external PSU. Everything else — its solidity, weight, layout, and sound — I loved. And then there was Total Integration. It's rather uncanny being able to tweak and organise a synth of this power from within your favourite audio environment (Ableton Live, Steinberg Cubase SX and Cakewalk Sonar for me), just like a normal plug-in, and without maxing out the CPU. That the synth can reliably offer basic audio I/O is the icing on the cake. The MIDI interfacing makes up the little piped bits around the edges, and when the control surface software comes on stream, the Virus TI will be covered in hundreds and thousands! Like Mark Wherry in the main part of this review, I found it best to not demand too much of this side of things: audio in and out running simultaneously with busy multi-part synth playback is best avoided. What's more, my ageing 450MHz Mac has only USB 1.1 ports, so although the plug-in wasn't too demanding, there was a little too much data moving up and down the pipe for it to be totally happy. Despite this, the sonics are great. The Virus TI's modelling gives you access to a wide palette of sound; whether you like your analogue acid-fat or modular-clinical, and want to mix in modern digital textures that jump to the top of the mix or blend wistfully, it's here. The presets even include drum sounds! With no less than 17 banks of 128-strong ROM patches, the Virus TI is impossible to summarise. In the 'leads' category, A095: 'Syncer' is classic with a modern edge, and C075: 'm@stock' just sings! Pads also abound, from textured backgrounds to upfront movers. The outright simulations of instruments are variable, but this was always the way with real analogue or FM. Here, the fake pianos, erzatz contrabasses and so on have the playability and 'feel' of the original without being fully imitative. The Virus's forté has always been serious bass. Practically anything in this department that comes up on the category search will impress, but try shaking your woofer with A008: 'Bombasdr'. B126: 'YamahaFB1' also does what it says — it's classic four-op FM 'thud bass'. But by way of contrast, there are also incredibly delicate sounds, such as D009: 'AprilPad'. The Virus TI arpeggiator is particularly good, many factory patches showing this off. Add a drum loop and it's instant dancefloor-filling material. Try the solid, traditional K031: 'Donkey', the jangly A002: 'AoilioA' or the Kraftwerk tributes of patches G042 to G047. And the Virus TI's three LFOs are also capable of some pretty funky arpeggiator-like tricks, as evidenced by A124: 'Zimoux' and A101: 'Thr3sum', for example. The new TI engine sounds great, and the Hypersaw and Wavetable oscillators add a great deal of new colour to the 'Virus sound'. The new operating system, better LCD screen and the improved control layout makes the Virus easier to use and clearer to understand. Did I mention it sounds great? Latency isn't great when using the instrument in Sequencer Mode and routing the audio via USB, and this could be a problem for real-time performance unless you set a low buffer size. Not every feature is ready in the first version of the Virus TI OS and Virus Control: non-real-time off-line bouncing and the Remote mode are noticeable omissions. 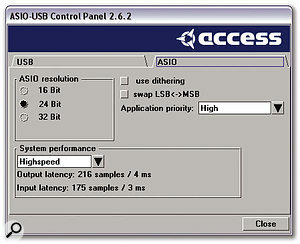 Access' implementation of the Virus TI as the centrepiece of your computer music system is commendable, and the company seems to have covered all the possibilities for total integration. The TI is also the best-sounding Virus to date. Virus TI Desktop model, £1199; Virus TI Polar model, £1499; Virus TI Keyboard model, £1499. Turnkey +44 (0)20 7419 9999.